According to the Developer the PS3 version will be the definite, and the best one. Also PS3 version will get some exclusive DLCs, which other versions won't get. But this is yet a rumor that is not confirmed and could totally be just a rumor. But given the fact that in Europe the PS3 Version gets a special "Chopper Edition" while Wii U and rest don'tn it sounds very likely. Where did this rumor begin? What is meant when you say best? I pre oredered the vita version but won't mind buy the ps3 version as well if there are major differences. Is the graphics what they are referring to when they say best? According to earlier posts of the Developer (on his blog) the effects of some attacks gave them trouble on the 3DS (framedrops) which is why they had to dumb them down and make them less impressive. Now with the PS3 they could restore the effects to what they were supposed to and the game isn't suffering any frame drops. While they were ever so small the 3DS version will be less fluent (framerate wise). The Vita Version is ought to be a little less on the graphical side but same on the framerate. No information about the Wii U version whatsoever (He kinda acts like it doesn't even exist).XD Many people complained about framerate drops on the Unlimited Cruise ports. While it's not that bad as last time, the 3DS is still not that strong. Therefore from any perspective Handheld Gamers should get the Vita Version, or the PS3 Version. eh....is that so? An eShop download? How....uncanny. Last edited by FireMeowth; June 3rd, 2014 at 12:18 PM. I guess they saw more potential in the Vita than in the Wii U.
Usopp+Chopper: Welcome to SBK Unlimited Red,Part 2. Usopp: SBK stands for: Shounen (Youth), Bouken (Adventure), and K! ....Wait a second what was K again? Usopp: Anyways,this is our next long-awaited adventure. Follow me! Chopper: I'll do my best! Usopp: Now let's see what awaits Luffy and his friends. Chopper: But didn't you just say to follow you...? Chopper: Uaah, What's that thing? Usopp: It's a dragon! But that one's smaller than the one I've beaten. Chopper: You beat one Usopp? Usopp: About 5... no wait 10 times. Usopp: I can take on anyone! Usop: Great. This worked out just as I planned. Usopp: Anyways let's explore the city and step forward. Usopp: Be careful. There are many different kind of traps on the field. Chopper: Huh, if you burst the bubble something comes out? Usopp: There are many different items on the field. You can take the items you found and bring them to your own facilities you've built. Or you can use them for the development of the city as well. Chopper: So I can use medicine, food and many other items, right? Usopp: Didn't I just tell you not to push? Chopper: But what can we do? I want to go ahead. Usopp: In such a case you can ask someone on the crew for help. Usopp: Brook for example can run on water. Everyone has some special skills which can prove to be very useful. Chopper: I can also be useful to you guys. With my horn point I can dig out things! Usopp: But I won't lose to you either Chopper. With my skill I can attract bugs. Choper: The miraculous Golden Hercules. Please catch him! Usopp: You have to press the buttons quickly. If you succeed you have a succeful catch. Usopp: That's why you should go with your friends on bug hunting. This way it will become easier. Usopp: If the level of your bug catching net is high, it gets easier to catch various bugs. 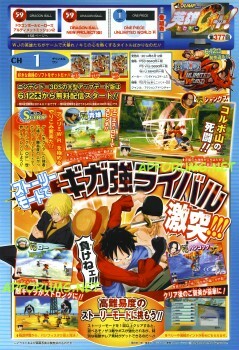 Usopp: Fishing on the field is another special feature. Usopp: This one's easy. Nyanyanyanyanyan. Usopp: There's a chance if you got it, that you might get a bonus. I wonder what kind of size we will get. Chopper: Oh no it escaped. Maybe you should just stop it. Usopp: Shut up! If you can't do it on your own, let your friends help you and also you can make your fishing rod better at the city and you can even get such guys. Usopp: All right, a big adventure awaits us. Chopper: Will we be all right? This is the Navy Headquarters. What is the Unlimited games playstyle? Are they action RPG? The games are kinda in a genre of its own, but there are definitely Action RPG elements in there. A lot of scavenger hunting too. You go around, fight and collect items you need to progress in the story. Most of the time you build something or develop a building in the city. I love developing stuff and ugprading principles, so to me Red is something I've been waiting ever since the Cruise series, and this one is gonna be gorgeous. On Amazon Germany the Chopper Edition is already sold out. Ebay of UK isn't even listing it. I'll admit the idea of it just being digital download is kinda steering me back to the 3DS version. Digital downloads always take much more room compared to physical copies, plus as odd as this might sound, I would like a physical copy of the game. Then again, HD fun and multiplayer with my brother. Aaargh. I believe only the sony systems in the US will be getting a physical copy. So if you plan on buying the game for a nintendo system either or would be fine. If I had both I would choose the wii u version just for the HD. No, the 3DS version is getting a physical release too.......HD is good, but the significant memory usage isn't. At this rate, I'll end up flipping a coin a day before it comes out. Well, memory usage isn't too big a problem with the Wii U considering how easy it is to connect an external hard drive to it (and it should be easy to find one for cheap, too). I do understand your desire to have a physical version of the game, though - I've always preferred physical over digital when it comes to video games. Can someone translate this, please? Don't know if this was answered already but, is there cross play because this would be the perfect game to have it for.